This week has been the hottest of the summer, much to hot to be outside gardening. 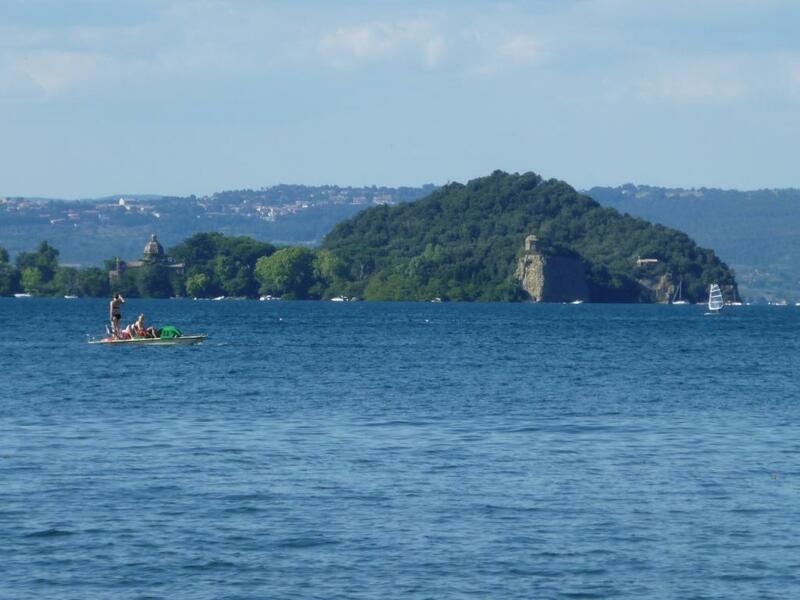 When I can I go to Capodimonte on Lake Bolsena for a swim and to cool off. This morning at 6 am it was 20°C and it must be in the high 30’s now. 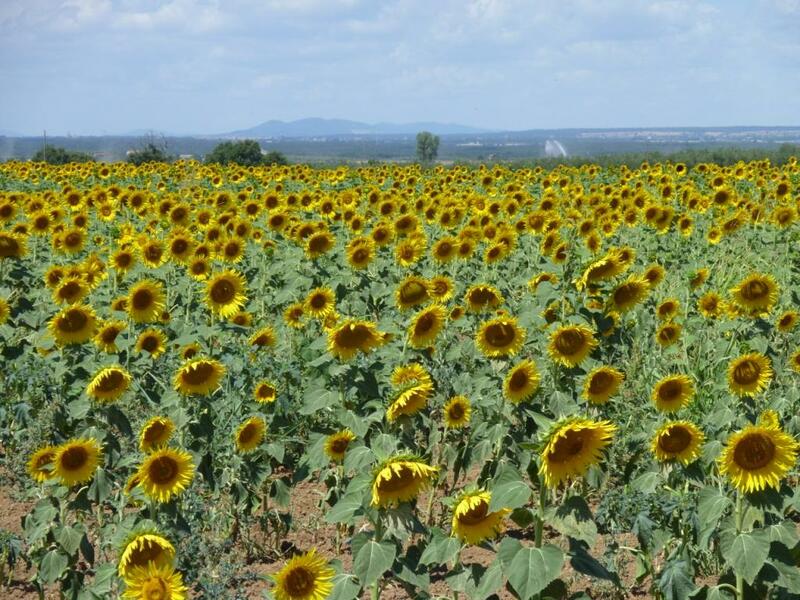 Sunflowers are a big crop in Umbria but this year, for the first time, they are growing sunflowers in the fields near our house in Lazio. 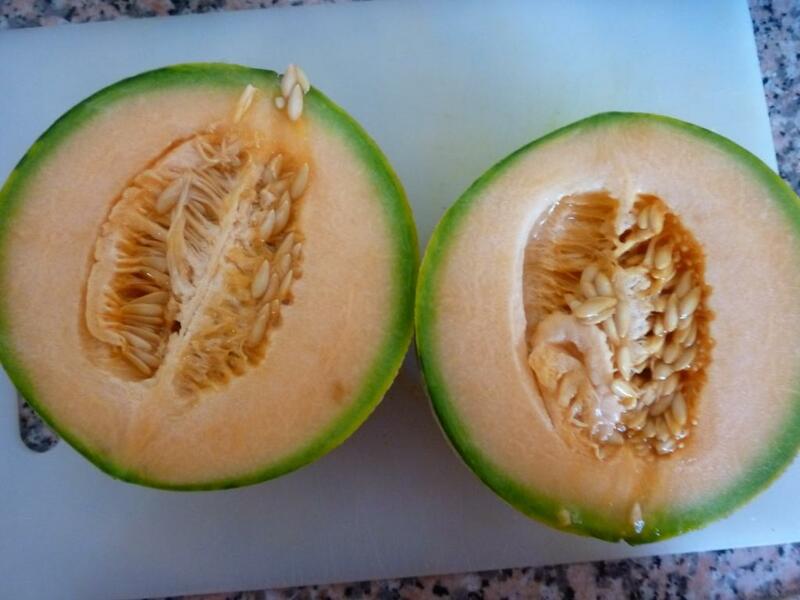 They are certainly a more bautiful crop than the never ending maize (grown as animal feed) which need so much water. In Italian their name is girasole (turn to the sun) which, is of course, just what they do! when I was photgraphing them they were covered with bees so another good reason to grow them. Other crops at this time of year are tobacco, tomatoes, melons, aubergines and peppers; but sheep are the most important form of farming – not for meat but for the all the wonderful pecorino cheese. About three weeks ago I tied in as many Wisteria stems as I could to make the framework for covering the pergola. 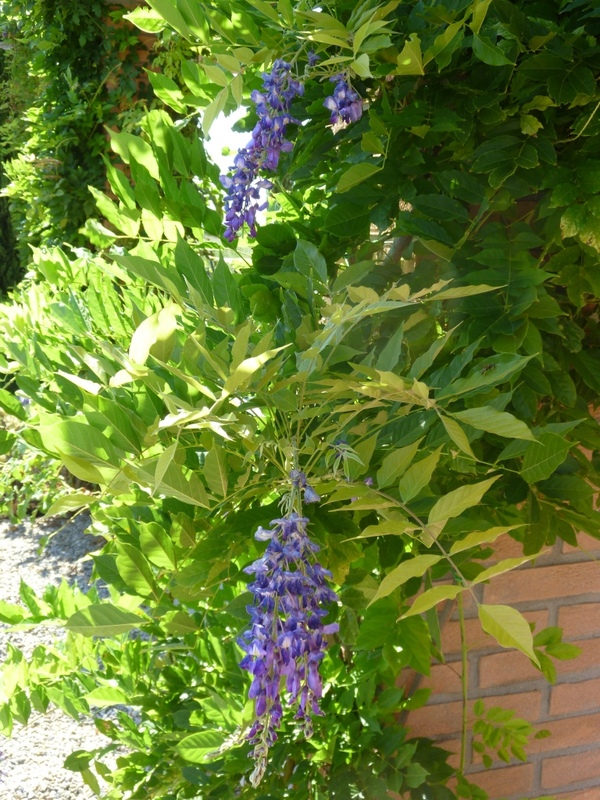 At present the terrance is shaded by the house so each side is shaded at a different time of day which is OK if the wind is not blowing on the part in shade; so the covering of wisteria will give us more flexibility as to where we can sit or eat outside. By pruning the plants have produced lots of secondary flowers, almost as beautiful as the first flowers in spring. 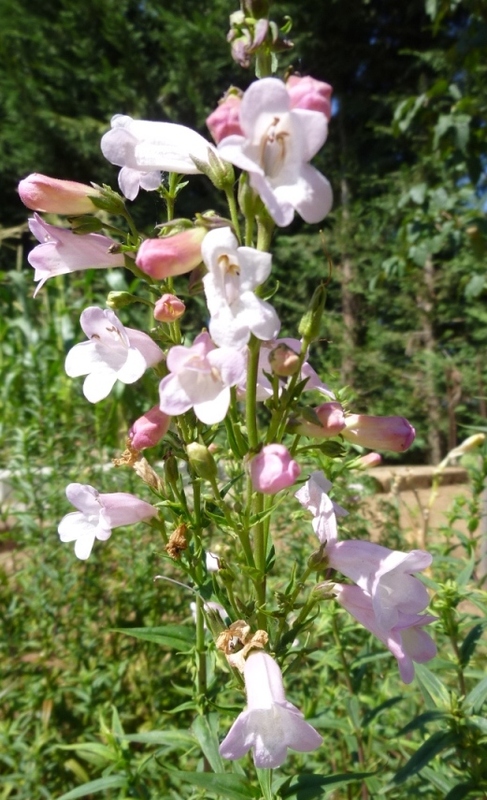 I’m not sure I’ve mentioned this delightful pink penstemon; it has been flowering without interuption since early June. 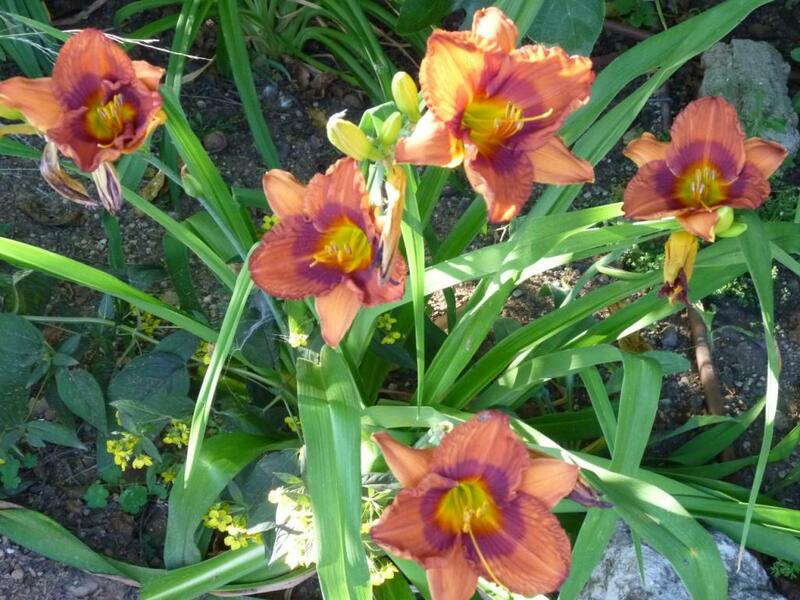 It is in a bed that doesn’t have regular irrigation, though it has been watered when it looked in need (which amazingly hasn’t been very often), I will try other colours and varieties in other borders. I have very much enjoyed the combination of Rosa Scepter’d Isle, Rosa Conrad Ferdinand Meyer (which flowered for the first time at the end of March and has flowered intermitently since), this penstemon and pink and white Gaura. I will add some pink tulips to extend the colour into early spring. I’ve also planted some very small white Agapanthus which will hopefully flower next year. 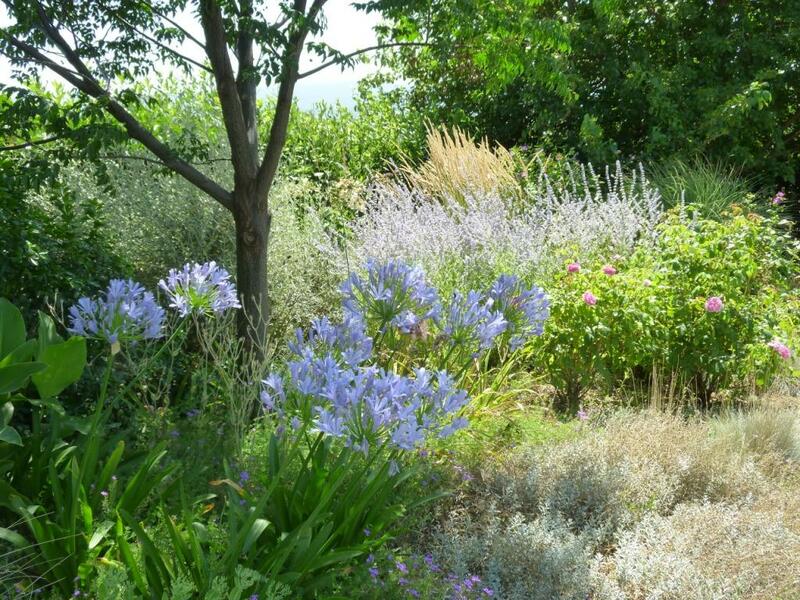 The border is backed by a Bay hedge infront of which is a dark purple, cut-leafed elder. I’ve decided to add some recipe pages so I will be able to find things to cook in future years. For Gazpacho soup follow this link to the mid-summer page. July has been hot, to begin hot and humid and ending hot and windy; though probably it hasn’t been as hot as other years the humidity has made it less bearable. However during the last week the Tramontana blew and it was cool and on Saturday there were thunder storms – very unusual in Italy in July. 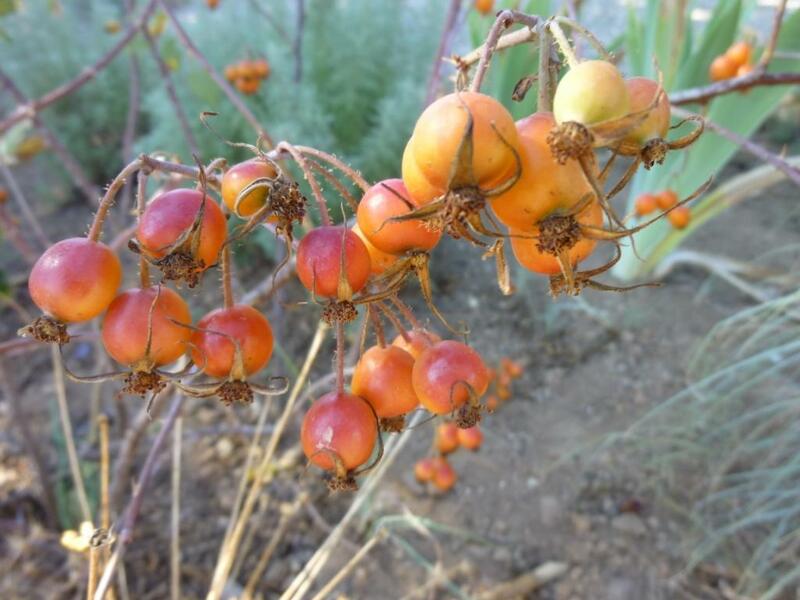 It has been a month where the vegetable garden has been more demanding than the borders. 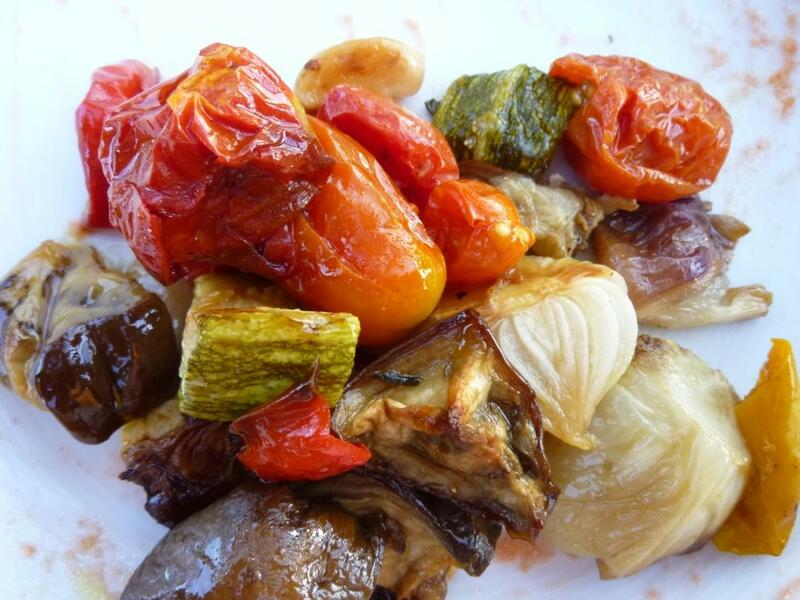 July has been a month full of vegetables and fruit, butterflies and bees, and dinners outside, beginning at sunset and continuing into the night. 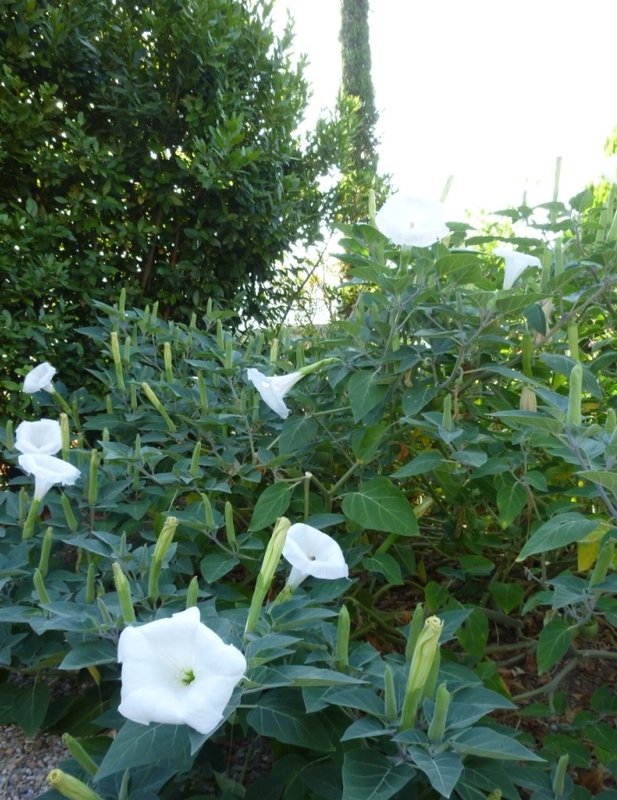 The sound of the Little Owl bring food for her chick, the bees so intent on drinking the nectar of the Datura flowers that they made perfectly circular holes in the petals so that they could enter even before they opened. Savouring the first melon, the first sweetcorn; looking anew at my recipe books to find interesting new recipes for dealing with the gluts. 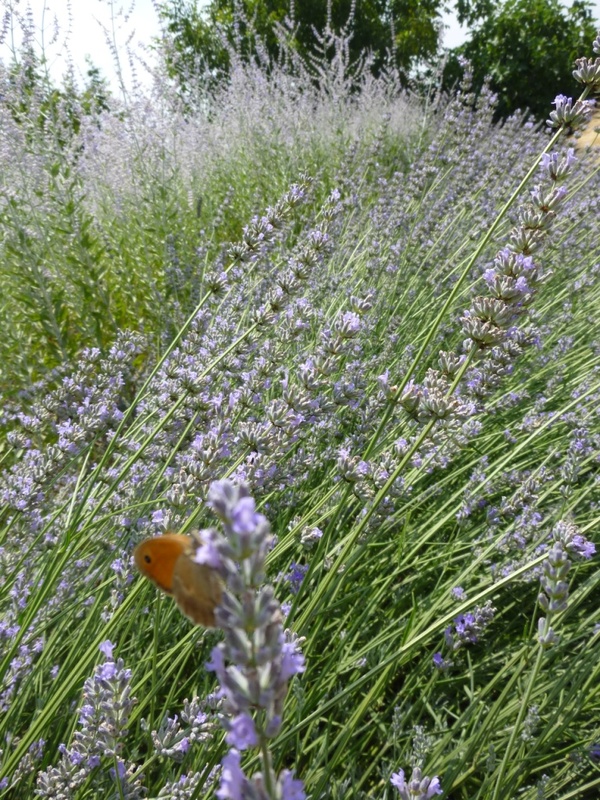 The lavender and perovskia have been attracting bees and butterflies all month. We have pruned the lavender (the last weekend of the month) it would have been better done even 2 weeks earlier – I feel I have regained the structure of the garden; it is only the cost that prevents me changing the lavender hedges to Myrtle. The wind has been so strong I have had to irrigate even some of the borders that I usually leave to wait for the rain. Leaves have looked crisp rather than luxuriant. Some plants have surprised me with how well they have dealt with the weather. 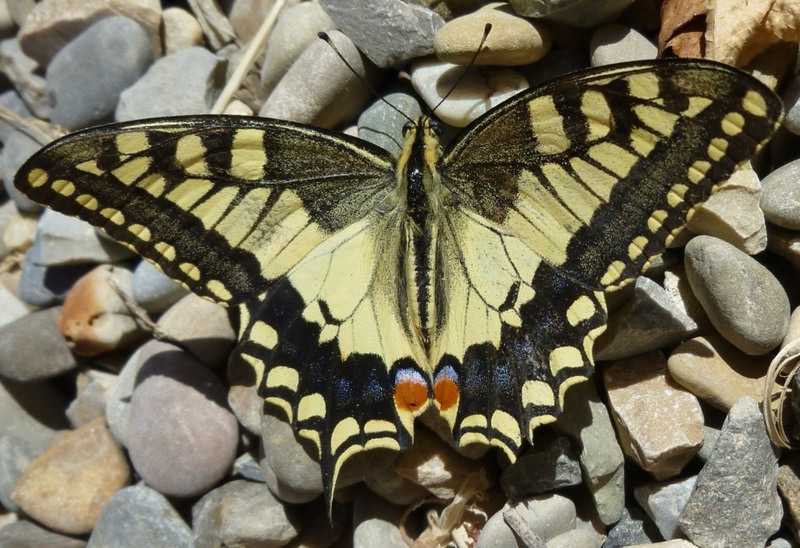 Hemerocallus are certainly overlooked as being suited to a hot, dry Mediterranean climate. They were flowering for much of the month. 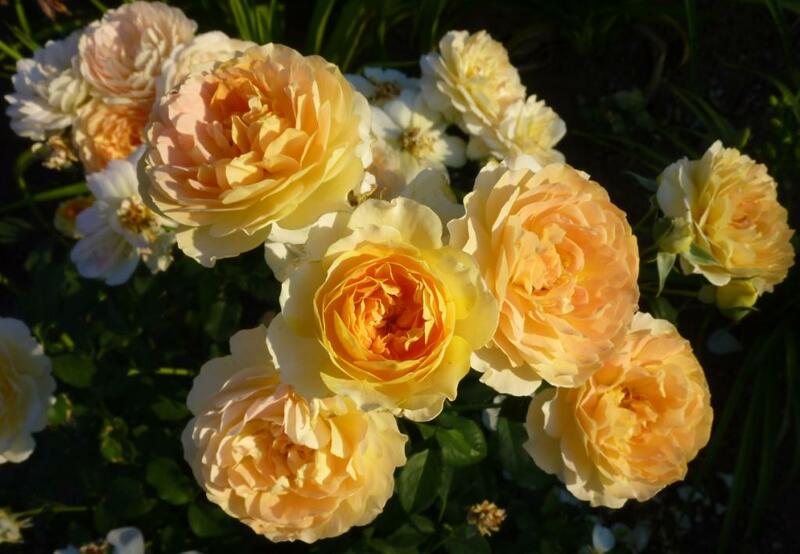 Rosa mutablis has also been in flower for much of the month as has Rosa Molineux, R. Scepter’d Isle, R. Westerland and R. Clair Matin. It has been cooking using the crops, trying to keep up with harvesting the tomatoes, zucchini, basil and the cucumbers. 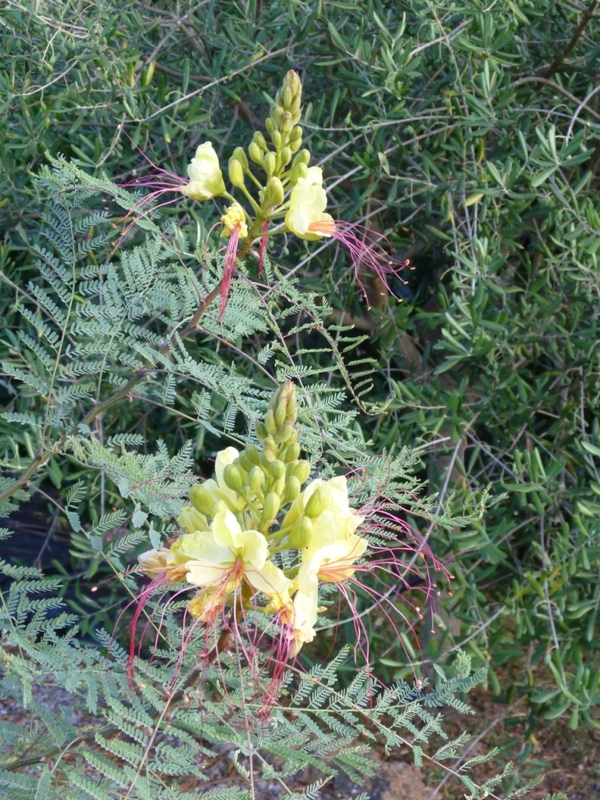 I was thrilled that Caesalpinia gilliesii flowered this month. A friend gave me a small cutting last year, so I didn’t expect it to flower this year. It is now a small, very small tree. The pleasure of the garden has been its abundance, despite the heat and wind for much of the month I have been very satisfied.